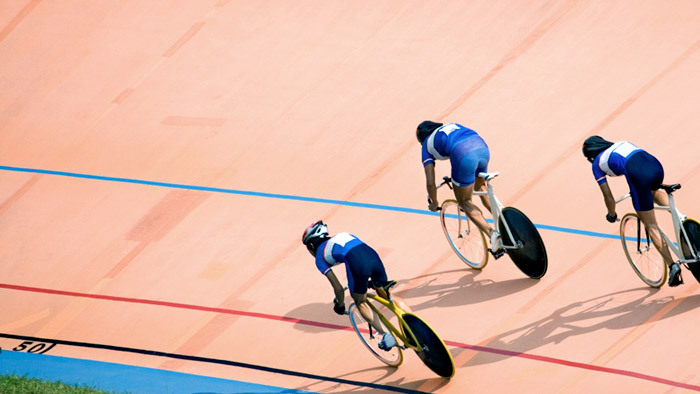 Track cycling has long history starting around 1870. To this day it remains an exciting and dynamic sport with Olympic and World Championship races. There are many types of track races. Formats include a single rider racing the clock, two riders sprinting head to head for less than one minute, to mass start races with 10 or more riders racing for over 20 minutes. Sprinters are seen as a select breed of highly muscled and explosively fast riders while endurance racers have to have the right mix of power, strength, and stamina. In recent years, riders like Bradley Wiggins, Mark Cavendish, Taylor Phinney, Rohan Dennis, and more have traded the velodrome for the open road. These riders have all commented that their track background has been a tremendous asset in their road racing. This begs the question of how could racing for one to four minutes on the track help to benefit road cycling where riders compete for four to six hours in a typical professional race. Firstly, endurance track events place a huge demand on aerobic energy pathways. Even though a team pursuiter competes for just under four minutes, they perform huge volumes of training on the road and compete in as many road cycling events as possible. This more than adequately prepares the track cyclist to complete long road races thanks to the high levels of fitness they develop. In road racing, while the total volume of riding is high, the race often comes down to key moments such as crosswind sections, climbs, priemes and counter attacks. This is where a track cyclist has an advantage spending time racing at high intensities which allows them to capitalise on opportunities when they present themselves. Track racing is a very natural way of performing the high intensity training a road cyclist needs to be competitive at the business end of racing. The nature of track cycling prepares a racer for the demands of the road. Track riders need to have very high levels of fitness, carry out high volumes of intense training and racing, and must be able to recover quickly. Track cycling also offers benefits of riding closely in a tight pack, riding on smaller gears at higher cadences, and the opportunity to practice tactics for sprinting. Road cyclists can take advantage of the way track cyclists race and prepare through utilising similar training methods. Because track cyclists spend a lot of time racing and training at high intensities, this prepares them well for road cycling events that come down sprints, last minute attacks, and key opportunities. Ideally in a group performing 3 to 10 sprints trying to vary position in bunch, distance to the finish (150 to 300m), gearing (53 x 11-17) and the pace at the start of the sprint from 5 to 25 mph. Allow full recovery between each sprint. With the variation of sprints the aim is not to develop one type of sprint but to develop the ability to learn fast and be able to respond to any type of sprint. The Kilometre event is one of the most painful challenges in track cycling. It requires a cyclist to completely deplete their high intensity energy sources and fight a huge amount of pain from the rapid supply of energy to the working muscle. This type of effort is the same as the final kilometre of a road race where a rider must hold position, fight for that position and then make the move for the line and fight through the same pain as a Kilo riding on their last lap. Three rounds of 6 x 60 second efforts again varying the gears, location (headwind, tailwind, uphill) and trying to adjust the pacing so you can maintain power for the whole 60 seconds. Full recovery between efforts. In a pursuit, a rider will be racing well over their threshold and up and over their max aerobic capacity. Racing at this level places huge demands on the oxygen system and provides an amazing stimulus and the demands are very similar for criteriums or road races featuring climbs or tough sections that are 2 to 8 minutes long. To prepare for these events, track cyclists perform efforts from 2 to 5 minutes at 85 to 95 percent of their power at VO2 max for these durations. Perform 3 to 6 reps with a 1:1 work/recovery ratio. The most challenging of events in track cycling are the mass start events where a rider is tested physically, technically, and tactically. This parallels the stop/start nature of criteriums and the final moments of most road races. To prepare for this track and road cyclists perform short intervals that test the limits of oxygen supply to the muscles as well recovering as fast as possible before needing to go maximally again. The variety of short interval options are massive and the most commonly used is the Tabata protocol. A four minute session of riding for 20 seconds at 170 percent of maximal aerobic power with a 10 second recovery before going again. These can be repeated for sets if you dare. Racing on the track is the best form of preparation for track cycling but this requires a track and organisation of racing. These intervals can be used to make up for a lack of racing in the specific preparation phase and the peaking phase of a training programme. Based off the success of track cyclists in road cycling events these forms of training would be excellent preparation for all endurance races. Hamish Ferguson lives in Christchurch, New Zealand where he has coached a variety of athletes, clubs and teams in track, road, MTB and Downhill Cycling since 1991. He is involved heavily in Canterbury Track Cycling running a development programme for new comers, is a Canterbury Region team track cycling coach and is contracted to Cycling NZ to deliver coach education course. His home town of Christchurch was hit by severe earthquakes in 2010 and 2011 and caused much damage and this has renewed his commitment to cycling and cycle racing in the region and he tries to ride his own bike most days. Find out more at his website.